This is the big building adjacent to the Forum shopping mall, viewed from the “back”. 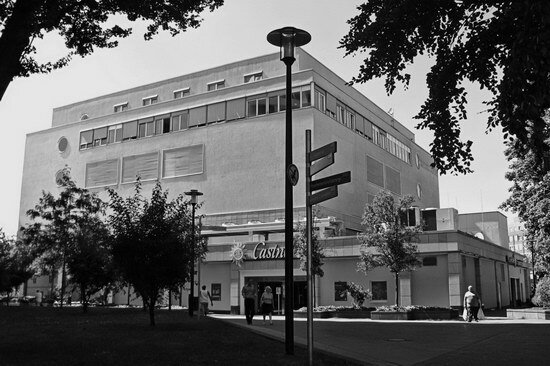 The today rather nondescript-looking building once housed a huge Hertie department store on all floors until the early 1990s, when it was extensively renovated. The building is actually hexagonal and about 100×60 meters across. It’s still accessible directly from the northeast end of the shopping mall, but the floors are now occupied by many different tennants. There are two grocery stores in the basement, on the ground level and first floor are two clothing stores and a toy store and the second floor is occupied by an 8-screen cinema, which has changed owners several times in the past few years. The third floor belongs to a hotel and on the fourth floor are some offices and a fitness center. Oh, and what you see on this photo is the entrance to a slot machine casino where a restaurant used to be – located directly opposite of a kindergarten!